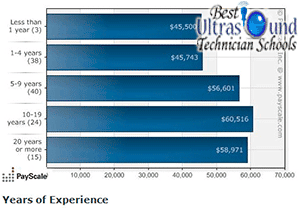 If you're interested in a career in sonography, chances are, you want to know what your yearly salary is likely to be. Since medical sonographers are highly skilled professionals doing demanding jobs, you definitely need to be sure you'll be satisfied with the pay before pursuing such a career. According to the U.S. Bureau of Labor Statistics, the average medical sonographer makes about $65,000 per year. The 10 percent of sonographers who are paid the most made more than $91,000 a year. However, the lowest-paid 10 percent made less than $45,000. These statistics are back from 2012, so the yearly salary of a medical sonographer might have changed somewhat since then. When it comes to ultrasonography, there are many areas of the field you can choose to go into. It's also worth mentioning that all specialty areas of sonography are not equal in terms of pay. Therefore, it could literally pay to research the salaries of various specialty areas before choosing one. An ultrasound techno radiology ultrasound makes about $64,000 a year. While this is definitely not a low salary, there are many other types of sonographers who make much more. For example, a cardiac sonographer and diagnostic medical sonographer make about $70,000 a year, while a registered vascular sonographer makes a whopping $88,000. Of course, by taking advantage of various opportunities, you can end up earning much more as a sonographer than the average salary. To become a sonographer, there are a number of routes educationally that one can take. If you already have healthcare experience, you can simply go to school for one year and get a certificate that signifies your qualification to work as a sonographer. If you don't have healthcare experience, one can get an associate or bachelor's degree. Obviously, if you get a bachelor's degree, you will likely be paid more than a sonographer with only a associate's degree. Strive to attend the best school you possibly can. However, also ensure that you choose a school with an excellent certification program for sonography. A school that is excellent overall may not be the best choice when it comes to training those pursuing a career in sonography. Finally, if you're not already set on a certain area of sonography, choose to be certified in a specialty area of sonography that offers higher pay. Such certifications will probably more difficult to achieve, but the career satisfaction and pay will make all the difficulties you encounter quite worthwhile. As you can see, the yearly salary of a sonographer is typically high, but definitely has the potential to be rather low. In general, a sonographer's salary varies depending on what specialty area they choose and their qualifications.